In August of last year, we harped about a self-healing electrical circuit that is capable of ‘regenerating’ its conductivity even when broken into two pieces. 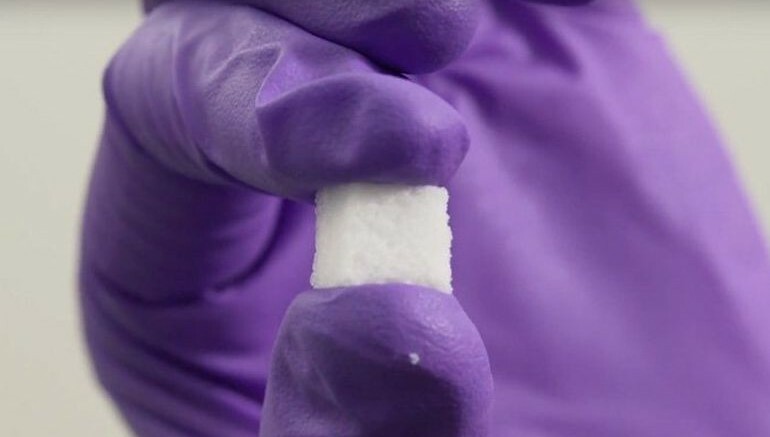 This time around, researchers from the Rice University have concocted a half-solid, half-liquid adaptive material that can not only self-heal but also ‘restrengthen’ itself into its original form even after going through compression. Christened simply as the SAC (or self-adaptive composite), the material in question is composed of sticky and very tiny (micron-scale) rubber balls that are grouped together into a solid matrix. According to the scientists involved in the project, the SAC was created by mixing two polymers and a specific solvent which had the conventional property of evaporating when heated. So after undergoing the heated phase, the process left behind what has been termed as a ‘porous mass of gooey spheres.’ So basically when the resultant substance is cracked, it has the fascinating ability to self-heal time and again. Furthermore, much like a sponge, it can regain its initial form after compression. Those [other self-healing materials] are very cool, but we wanted to introduce more flexibility. We wanted a biomimetic material that could change itself, or its inner structure, to adapt to external stimulation and thought introducing more liquid would be a way. But we wanted the liquid to be stable instead of flowing everywhere. The sample doesn’t give you the impression that it contains any liquid. That’s very different from a gel. This is not really squishy; it’s more like a sugar cube that you can compress quite a lot. The nice thing is that it recovers. So beyond the inner scope, how does the self-healing material actually perform in a real-time scenario? Well lab testing as showed that SAC can account up to a maximum of 683 percent increase in the material’s storage modulus – a parameter that defines its self-stiffening capacity. Suffice it to say, this enviable number is higher than even solid composites. And the best part is, the researchers have claimed that they have devised a technique to scale-up the process, given the relative ease of actually concocting SAC and its inherent flexibility that can be further modified to suit any potential application. The study was originally published in the journal Applied Materials & Interfaces.